With its wide range of applications in various industries, the iMScope TRIO meets the versatile needs of R&D challenges. The iMScope TRIO revolutionary technology combines an optical microscope together with a mass spectrometer. It is applied to cutting-edge R&D and identifies what users see at the molecular level. iMScope TRIO features extensive functionality for structural analysis through highly accurate MSn analysis. In manufacturing, it supports stable production of high quality products, e.g. in surface inspection. Shimadzu is pursuing cooperative research with research agencies to develop more applications for basic research including cancer research and brain function analysis, drug delivery systems (DDS), metabolomics, forensic medicine and lipid analysis. Together with the National Cancer Center in Japan, cutting-edge research results have been obtained that are expected to contribute to ultra-early diagnosis of diseases and drug discovery. The iMScope TRIO is capable of overlaying observation images from an optical microscope and molecular distribution images obtained by mass spectrometry under atmospheric pressure conditions of ionization which feature a high resolution of 5 μm or less, the best in the world. This enables detailed analysis of regions of interest, including observation of the lesion area and distribution of anticancer drugs. 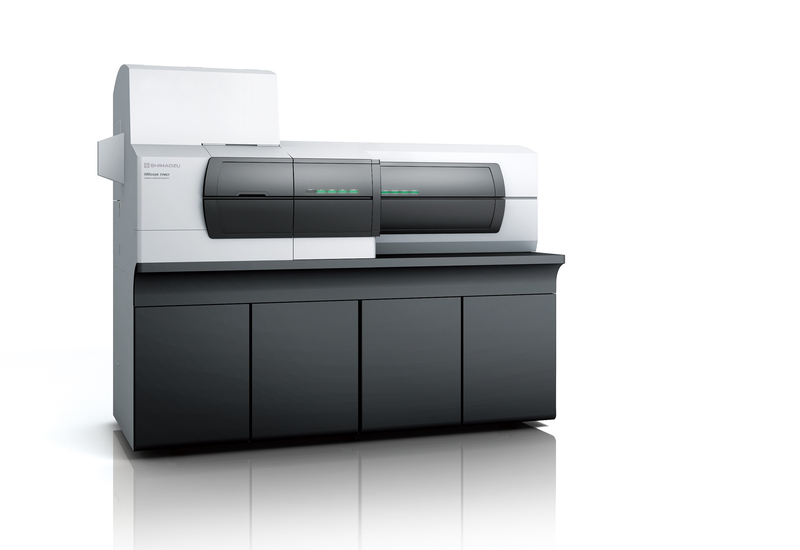 Enabling high accuracy and precision mass spectrometry, the iMScope TRIO provides high level qualitative analysis via the IT-TOF function, which integrates ion trap (IT) mass spectrometry for MSn analysis with time-of-flight (TOF) mass spectrometry. Not only limited to imaging samples, the system is also capable of analyzing samples extracted and separated from tissues via connection with a liquid chromatograp.